· Eight riders from four states. · Lead group ride stats: 111 miles, 10,100 feet of climbing, 17.1mph avg, 4 gaps completed, plus Granville Gulf both ways. · One flat, no mechanicals. · Most memorable quote: "I bet 4 out of 5 doctors would tell you to stay indoors today." I think Mike said this after climbing 24% Lincoln Gap. · Moral of the ride: Guys that finish last get the girl! 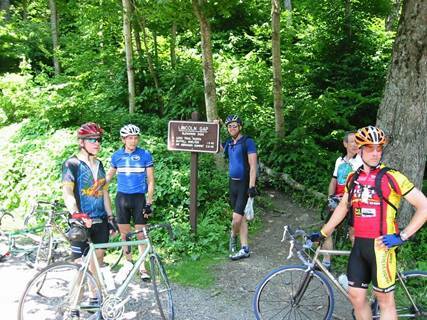 Eight riders set off on a Green Mountain adventure Saturday morning at 8:30am. The forecast was calling for some very hot, humid, but probably dry weather. We were sweating before we even got on our bikes. We had no idea it would be a record breaker day for temps. We climbed Brandon Gap first, the easiest in grade and vertical gain. It’s about 1300 feet over 9 miles. The first climb already spread the eight of us out some, with Brett setting the pace. We waited only a couple minutes to regroup before beginning the descent. Descending to Brandon is the fastest. Pavement was in fair shape with slowly sweeping turns except for a chicane half way down. I hit 54mph, tying my all-time record coming down Whiteface Mountain. Steven stayed right with me on the descent, possessing excellent handling skills from earlier racing days. 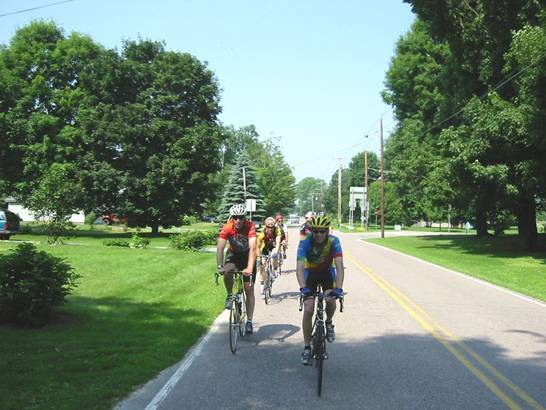 We maintained a paceline with eight riders through Brandon and around Dunmore Lake. Middlebury Gap begins very steep at the bottom, and then the grade moderates as vertical is gained. From the top of Middlebury Gap, David and Mike rode on ahead to Lincoln Gap, planning on us catching them at the top. The rest of us stopped at the store on Rt 100 in Hancock to restock fluid and fuel stores. Steven told us not to wait for him after Middlebury Gap, struggling with a back issue on the climbs, and that he'll be fine on his own. 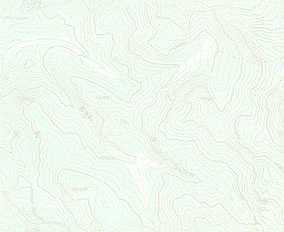 He had a detailed map of the route. I bought three 32 oz bottles for my empty Camelbak (which started with 90+oz in it). So Brett, Jason, Glen, Tom and I paceline north on Rt 100 to Lincoln Gap. David and Mike were ahead of us, Steve took a slower pace behind us. The views in this valley were just gorgeous with ranges going up steeply to either side. Lincoln Gap is a beast. It starts steep pavement, then not so steep gravel, then nasty steep pavement to the top. The last two miles is steeper than anything you have ridden, and the last mile averages 20-24% grade! That's about 1000 feet gain in a mile. My cadence was 30-40rpm on this section with a triple!! My heartrate was 171bpm (93% max) at 3-4mph for a long time!! That's how steep this beast is. Just ask Jason. His pedals stopped, he tried to make them turn, but his front wheel lifted up and flopped over to the side. He just got his foot out in time. It was so steep he couldn't clip back in again to get started. Only a few of us cleared the top. Heading north on Rt 100 to climb Lincoln Gap next. You can see how oppressively humid it is. By now the temperature is into the 90's, and the heat index is over 100. We were all at our thermal limit. We decided at that point that even four gaps were going to be a challenge. 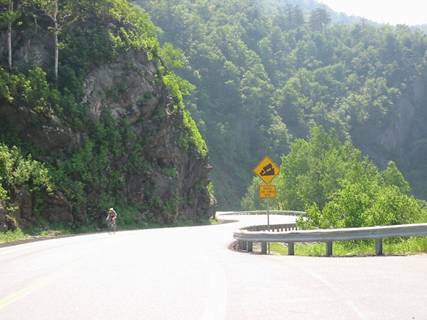 Once you go down the back side of Lincoln Gap, you have to go over again to get back to the side the cars are on. Tom, a tall Clydesdale class rider, decided to play it safe and headed back down Lincoln Gap and to the cars 19 miles down Rt 100. David already charged on ahead to Appalachian Gap. The rest of us decided to do App, but then head 25 miles down Rt 100 back to the cars, skipping Roxbury and Rochester Gaps. Top of Lincoln Gap. Gary, second from left, was not part of our ride group. Gary organizes the GMSR each year. The descent down the west face of Lincoln Gap is mostly gravel. It was a little looser this year than last. I still felt ok on it, but everybody else was quite tentative on the stones. Must be my MTB experience. Jason had to make a couple rim cool down stops on this descent. There was also a half mile stretch of freshly torn up pavement (very loose gravel) we had to ride through as we entered Lincoln at the bottom. Thermometer there said 94 in the shade. Bought two more 32 oz bottles of fluids. So now we still have David off the front heading towards App gap, Tom heading back to cars, and Steven on his own. The rest of us head to App Gap. The heat in Lincoln was oppressive. Each time we stepped into stores, we didn't want to come back out. App Gap starts out modestly steep for 700-800 feet, then descends 300ft before beginning the real climb. On the initial "baby gap," the heat exhaustion was reaching a critical level in all of us. We passed a white water stream and looked at each other, and that was it. We turned around and were in there in a heartbeat. Getting goose bumps all over again thinking how it felt to dip my helmet in that ice-cold water and put it over my head. Some of us sat right down in the stream. That had to come close to the highpoint of the ride for some of us. Getting back on our bikes in the sun again, we resumed the App Gap climb. The stream was near the top of baby gap, so we first had that nice descent before hitting the sustained steep climb to the top. The top of App Gap is where the finish line is for the Green Mountain Stage Race (GMSR). The cool down was refreshing, but very short lived. I almost immediately started hitting my thermal limit. Brett blasted up to the top. Maybe heat exhaustion caused him to hallucinate in thinking he was racing to the finish in the GMSR! Most of the way up, we catch David. He was not doing well, stopped at the side, pretty much succumbed to the heat. He was feeling nauseous. He made it to the top, but was not going to be able to stay with us on the 25 mile ride back to the cars on Rt 100. There's also a 500 foot mini gap on that route. The views from the top of App Gap were gorgeous, but I was too wiped out to fully appreciate it. The 6 of us descended App Gap together (the side the GMSR climbs in the prologue TT). I refueled again with another two 32 oz bottles. David wanted to soft-pedal it back at his own pace, so the rest of us continued to the cars at a moderate pace. Glen had planned on doing only four gaps anyway due to an evening commitment and was running late. After Mike did a strong pull, he started cramping and told us to go on ahead. Jason and I planned to back-track with the car to make sure David and Mike were doing alright. With only 6 or so miles to go, Glen disappears off the back of the "pack." Turns out his legs seized up. Jason's, Brett's, and my legs were completely gone and cramping too. With so much fluid loss, it's almost impossible to maintain an electrolyte balance. I even added Endurolytes to my Camelbak mix. We only did 2/3 of the ride essentially, and we were trashed. When we got to the cars, Tom's car was gone – good. Steven's car was still there – not so good we thought. Brett and Glen took off. After taking a quick dip in the river right there, Jason and I went back to check on Mike and David who weren't back yet. As we come into Rochester center, only 0.4 miles from the cars, we see Steven sitting on a park bench next to his bike. The problem was he seemed out of it. He was extremely dehydrated and nauseated. I never had seen more body salt on a jersey before. He probably should have gone in and he knew it, but as an experienced cyclist, he understood his condition and what he had to do to resolve it. He half jokingly said “what I really need right now is a saline IV.” He didn’t want us to call anybody though. We left Steven there for a few minutes to check on Mike and David, who should have been back by now. Mike was doing fine and almost back to the cars. David was only a couple miles behind him, and riding and chatting with a beautiful woman! Go figure. Turns out she was a sweep for a big organized ride called the L.A.M.B. ride (Lincoln, App, Middlebury, and Brandon gaps). So we stopped at the park again to talk with Steven. He was drinking fluids. We stayed with him until David came with his truck and gave him a ride to his car. He said he was good to drive home that evening, although David tried to persuade him to spend the night locally where David was staying. Steven let me know the next morning he made it home fine that evening, but had a lot of fluids to make up. What Steven did was, instead of taking Lincoln Gap after Middlebury like we did, he continued slightly further north on Rt 100 and climbed Roxbury Gap next. He did Roxbury/Rochester Gaps, while we did Lincoln/App Gaps. He did almost as much climbing and mileage as we did, most of it solo, in about the same time! That had to be tough. When we left David behind at the bottom of App Gap, he was feeling quite trashed. He pulled over to a grassy park area, laid back on the grass, and immediately dozed off. He wasn't sure if 3 minutes or 30 minutes went by, but he was awakened when a beautiful, fit women was standing above him asked if he was heading down Rt 100. He was in fact, but she was a sweep for a different ride. They ended up riding the rest of the way back to Rochester together, having a nice conversation. It turns out Mike barely made it back too, for a different reason. He really didn’t want to ride alone, and we were reluctant to let him, as he didn’t have a pump in case he flatted. We agreed to come back if he didn’t make it back shortly after we did. Well, with about 6 miles to go, he flatted. He tried hitchhiking and walking before a cycling group came by with a pump. The flat got fixed, and he was back on the road just before David would have caught up to him. How unlucky is that, of all the rider-miles without a flat, the minute we leave the one rider without a pump he flats? Two lessons learned I guess – carry your own inflators and don’t leave a rider alone without an inflator. Tom made it back just fine. Feeling like the rest of us did, he stopped for a dip in the Mad River. In Granville, he also spotted a young bull moose. So that left everybody accounted for. I feel somewhat defeated by this ride, so I might have to try it again later this fall when it is cooler out. Most of us said they enjoyed the ride. David is already talking about next time, and all six gaps, possibly solo! At least two people set PRs for most miles and vertical in a single ride Saturday. Brett called me the next day to say the ride was an Epic. Had I known how hot it was going to get, I would have proposed a date change. The forecasted high went from 78 to 94 in less than a week. I consumed over 300 ounces of fluids during the ride, a lot more in the evening, and still weighed three pounds lighter the next morning. I think most, if not all of us would have completed 6 gaps if it weren't for the heat. Riding only 4 gaps this year was way harder than riding all 6 gaps last year. Our pace was slightly higher too, and factored with the heat didn't help matters.